1) Sonication: It can be really difficult to reach saturation for some compounds. Since we started the ONS Challenge project in the fall of last year students have used all kinds of methods to mix the solvent and solute. For a while we required that solid remain during 10 minutes of vortexing. However, this proved problematic for doing lots of samples in parallel and required the researcher to stand there holding the vials on the vortexer. So to be able to leave samples mixing unattended we started using a sonicator. This certainly seems to be a major improvement over vortexing. But, as an unintended benefit, sonication also caused the temperature to rise. Upon cooling to room temperature, additional solid is often observed to come out of solution - the only sure guarantee that saturation has been reached. Our current protocol is to continue to add solute until 30 minutes of sonication leaves solid in the vials. Temperature of the bath is also taken before and after to ensure reproducibility. 2) Screw Cap Vials: One of the problems with sonication and increasing temperature is that standard one dram vials with caps that snap in often pop out. Using half-dram vials with screw caps completely solved that problem. 3) Filtration, centrifugation and decantation: Coming up with a common protocol to separate the supernatant after saturation is reached is not as straightforward as it might seem. The problem is that saturated solutions can behave quite differently. The easiest behavior to deal with is when the solute just settles on the bottom and simple decantation can be used. This typically happens for low solubility cases where the solute is much more dense than the solvent. In other situations a suspension forms that does not settle quickly. Centrifugation for a few minutes often resolves that issue and then the supernatant can be decanted. However, there are more difficult suspensions that do not settled after centrifugation. The worst of these actually form a gel. We have found that filtering through as Pasteur pipette packed with a small piece of cotton usually does the trick. The gel or suspension is transferred into the pipette and a bulb is carefully squeezed to try to get at least a drop of supernatant out. Even getting a single drop can be challenging sometimes so it is fortunate that our NMR method does not require accurate volume measurements. 4) Evaporation of supernatant: Sometimes we observe higher solubilities than the known saturation values. This was puzzling because looking at the NMRs it was clear that the ratios of the solute to solvent were real. We traced back this problem to the way the supernatant is handled. When the drop is introduced at the top of the NMR tube it rolls down and a significant amount of solvent can evaporate. When the deuterated solvent is then added the ratio of solute to solvent will appear to be much higher than it was in the saturated solution. This is especially problematic for volatile solvents like THF. A similar effect can be caused by waiting too long to take the NMR as solvent does evaporate slowly even with a cap on. The solution to this problem is to transfer the drop of saturated solution directily into a vial containing the deuterated solvent and taking the NMR immediately. 5) Deuterated solvent considerations: We have also had problems with solutes precipitating out when diluted into the deuterated solvent. Polyphenols in DMSO or THF tend to do this when diluted in CDCl3. In this case diluting in DMSO-d6 resolves the issue. If a solvent other than DMSO is used non-deuterated DMSO can be added to DMSO-d6 to conserve deuterated solvent. Its only purpose is to enable locking during NMR acquisition. 6) Additivities of volumes and density predictions: There are two assumptions made in the way we measure solubility - that volumes are additive and that the predicted densities (via ChemSpider) of solid solutes are accurate. If one or both of these assumptions is a dominant contributor of error, we would expect the maximum deviation to occur at higher concentration. 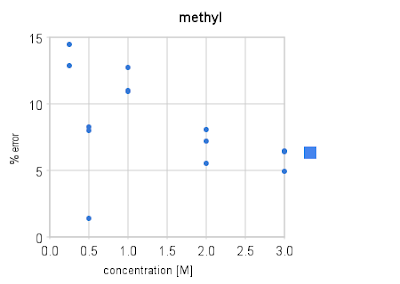 To investigate this issue (EXP102) David Bulger made up known concentrations of 2-phenylbutanoic acid and measured the SAMS solubility using the integration of the terminal methyl and the methine proton. Then the error was plotted against concentration. It turns out that the error does not increase with increasing concentration suggesting that - at least in this system - those two assumptions hold up to 3M. However there was a marked difference in the error of the methyl (8.4% average) and the methine H (26% average). Clearly the methine proton is systematically under-integrating, a feature of a longer relaxation time. The solution to this in general would be allow sufficiently long relaxation times during NMR acquisitions and we are looking into this. Still, lets put these results into context. Is a 26% error that bad? Well it depends on the application. The purpose of this project is to give chemists guidelines in choosing solvents for carrying out their reactions. Whether the solubility is 1M or 1.26M is not going to be of much concern to plan a reaction at 0.5 M and rules out reactions at 1.5M. Also note that very small temperature changes can have very large effects on solubility. For example if we look at the solubility of 4-nitrobenzaldehyde in various solvents between 26C and 19C we find differences of 45% in acetonitrile, 34% in benzene, 59% in carbon tetrachloride, 42% in methylene chloride and 36% in toluene. This temperature range is within the variation of what could be considered "room temperature" in a lab (at least the ones I have worked in). Sometimes temperatures are reported in solubility studies but often they are not. For example, the solubility of aspirin is reported as 1:5 in ethanol in this book. No exact temperature is given and this is not a very precise measurement. But there is enough information there to plan a reaction or to gain an appreciation for roughly how much solvent to use for a recrystallization. We will never control for all parameters. For example, even if we have an exact measure of temperature (and recently we have been leaving vials equilibrate in 23C water baths), we don't degass solvents or work under rigorously anhydrous conditions. The key question to consider: Is it more useful to make our results available immediately and improve them over time as we learn - or is it more helpful to keep them closed until an arbitrary standard has been reached?